A week in Venice is the right time frame to enjoy it in all its facets, appreciating the most beautiful and characteristic things of this city, rich of history and tradition. You can do and see a lot of things including: eating at “bacari” (typical Venetian tavern), “gondola” tour (a typical Venetian boat), “vaporetto” tour (a ferryboat), visiting many churches and museums for a unique holiday and an opportunity to not be missed! What does Venice offers in a week? Venice is a city not so extended, but it is full of museums, works of art and a lot of things to see. Moreover, if you are thinking about spending 7 days in Venice, in this article you will find many ideas for the smaller islands (including Murano, Burano and Torcello) and some art heritage cities such as Treviso and Verona. There are many ways to get to Venice, but certainly for a week two ways stand out: the train and the plane. The “Venezia Santa Lucia” train station is well connected to all the main stations in Italy (Rome, Florence, Milan, Naples, …) and thanks to the “frecce” (high-speed train) it becomes more favourable than the plane (both in terms of time and money) but also convenient because you reach the historical centre without others transports. For more detailed information, please feel free to visit the website of Trenitalia or Italo. On the other hand, the plane can be suitable if you are coming from far away and maybe you have found a tempting offer, less expensive than the train. The two main airports to reach Venice are the “Marco Polo” in Tessera (you can reach easily “Piazzale Roma” or St. Mark’s Square with the bus or via ferryboat) and the “Sant’Angelo” in Treviso (in 30 minutes with taxi or bus you will arrive in Venice). Take a look at the Expedia website to find some offers for your holidays in Venice. Once you are in Venice, there are two main solutions to move around the city: either by foot or by the “vaporetto”. Venice was built on water, therefore it can not be driven by cars. If you do not want to walk through the streets and bridges (435) you have to take the ferry (7,50 euro for single outbound ticket) and we suggest you to look at special tickets or those for 1,2,3 days or a week (if you plan to use them for more than one ride). You can do your own ticket at the ticket office (also automatic) outside the ferry stop or when you get on board but you have to ask for it at the ticket inspector. The lines connect every area of the city but pay attention at the different lines and the direction of travel (most of them are circular). For much information visit ACTV website. The “sestiere di Castello” is connected to the “sestiere di Cannaregio” via the “Ponte dei Santi Giovanni e Paolo” (bridge) and also to the “Riva degli Schiavoni” via the “Ponte della Paglia” (bridge). We remind you that this is the only “sestiere” that does not overlook the Grand Canal, but it includes the entire complex of the Arsenal. A part of the large complex every year hosts the “Biennale di Venezia” and we recommend you to visit it if it is open. Finally, take a walk through the “Giardini Pubblici” (public park) which make up the largest part of the city’s greenery. In the same year, “Via Garibaldi” was build. Today is full of life and shops, bars, restaurants and so on. In addition, every morning there is a market of fruits, vegetables and fish. The St. Mark’s area has the famous Square, but also a lot of other attractions. You could make a short visit of the “Palazzo delle Prigioni” to see where the prisoners were imprisoned and the paths that they carried out. Next to “Palazzo dei Prigionieri” there is “Palazzo Ducale”. We suggest you to book the ticket online on the official website to save time and to know the timetables, closing days and other useful information. On this website you could also find the ticket to visit the “secret itinerary” and, if you do not want to waste time you should buy the skip-the-queue ticket in Doge’s Palace. Another thing to see is the “St. Mark’s Church”, which represent the power of the “Serenissima”. Also here, we recommend buying the skip-the-queue ticket to do tours with a guide to the Church and the “Palazzo Ducale”. “San Polo” is the smallest “sestiere” and it is one of the biggest square in Venice. The historical walls of “Campo San Polo” show a part of the city’s history, the one called “Venezia Libertina” (liberty Venice) with characters like Casanova. Here you will find ancient buildings like “Scuola Grande di San Rocco” which was the seat of a charitable brotherhood of wealthy Venetians and takes the name from the corpse of St. Rocco. In 1564 they had asked to Tintoretto (painter) to decorate the school. It is reachable by foot or by vaporetto (San Tomà stop). In this area you can also visit the “Palazzo Corner Mocenigo”, a museum inside a Palazzo (noble palace) near “Rialto” and it is easy reachable by foot from the station or with the ferry (S.Stae stop). “Cannaregio” is one of the largest “sestieri” of Venice and is located between the “sestiere di Castello” and “sestiere di Santa Croce”, connected through the “Ponte degli Scalzi” (bridge). Among the most important churches there are: “Chiesa di Santa Maria dei Miracoli” (decorated with painting of mermaids), “Chiesa della Madonna degli Orti” (with paintings of Titian), and “Chiesa dei Carmelitani Scalzi” (originally frescoed by Tiepolo, it was destroyed by a bomb during the war. What remains of the fresco is visible now at the “Gallerie dell’Accademia”). In “Dorsoduro” there is the “Ponte dell’Accademia”, which had to be a temporary bridge and last only a few years. On the highest point of the bridge, do not forget to take a 360° tour to see all the beauties present in the surroundings. At the end of the bridge you will find the “Gallerie dell’Accademia” with the history of Venetian paintings from 14th century to 18th century. Here you can admire masterpieces like “The Tempest” of Giorgione, “Pietà” of Titian and other works of art by Tintoretto and Veronese. In “Campo Santa Margherita”, the central square, you will find some “bacari” to taste some typical Venetian food. There are also many artistic shops and good restaurants. “Ponte dell’Accademia” is an excellent connection to reach the most touristic part of the city. The “sestiere Santa Croce”, named in honour of the “Santa Croce in Gerusalemme” (Holy Cross of Jerusalem), is the smallest “sestiere” of Venice and is connected to the area of Dorsoduro and the “sestiere di San Polo”. Crossing the “Ponte degli Scalzi” is also possible to reach Cannaregio, where the train station is located. This “sestiere” is one of the least known by tourist. Do not forget to visit the churches of “San Giacomo dell’Orio”, “San Simeon Grando”, “San Simeon Piccolo” and “San Nicola da Tolentino”, where today the seat of the University of Architecture (IUAV) is located. “Ca’ Pesaro” is one of the most important historical buildings of the “Serenissima”, where the modern and contemporary art museum is set. We suggest you to visit “Palazzo Corner” (the seat of the Biennale’s archives) and “Palazzo Mocenigo” (the museum of the fabric and the costume). Finally, for your children you might be interested in the “Fontego dei Turchi” area with the Natural History Museum. The Gondola Tour represent one of the main attractions and is considered one of the landmarks of Venice. There is nothing like this around the world and it is what makes the city unique. It allows you to observe the city from a different point of view. Why don’t you decide to take a gondola tour of Venice? Have a look at the itineraries that we suggest you in the post of VeneziaHelp. From the train station or the bus station (Piazzale Roma), line number 2 allows you (at a low cost) to make a vaporetto sightseeing tour around Venice (in about 1 hour). You can get the ticket at the automatic ticket offices that are outside the vaporetto stop. Otherwise, if you have already the idea of using often the ferry, is better to purchase a travel card on the website of the public agency ACTV that carry out the service. Here you can find different lines (with stops), timetables, prices, some special tickets (such as time-limited travel card) and other useful information including accessibility, emergency services, etc. We recommend you to do the night tour because in this way you can see Venice with a complitely different point of view. Breakfast is an important moment in the lives of Venecian people, it is even more important to you because you have to walk up and down the bridges all day long (unless you travel with the ferry). For this reason, you should try the pastisseries all over the city (or in a classic bar). But do not worry, there are also very good alternatives for the people who eat gluten-free food! 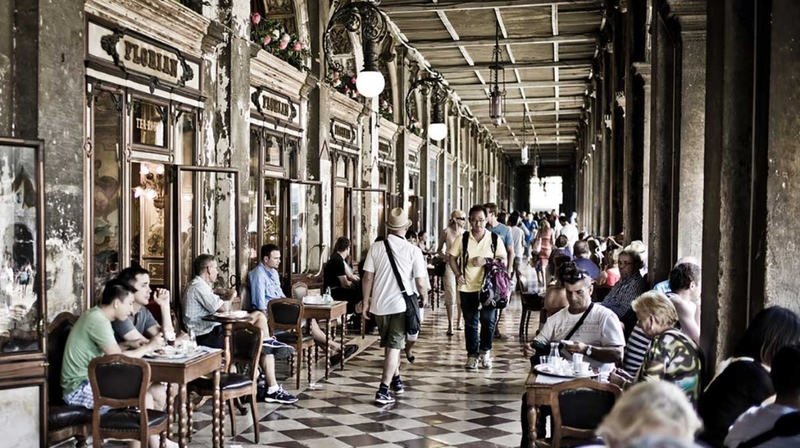 For the lovers of classic Venice and who do not care about the cost, we advise to go to one of the historical cafes in St. Marks Square, such as “Caffè Florian”, the oldest one (a place where the main Italian and foreign personality of the history of literature and art were used to go). In Venice, an aperitif is a real ritual. If you want to taste a Venetian Spitz or an “ombra di vino” (glass of wine), you will find many “bacari” and “osterie” (bars) where to toast the day just passed and try an appetizer and a glass of wine (we recommend the area near Rialto). “Bacari” are a kind of little bars, where you can discover the typical Venetian food and wine in a rustic and convivial atmosphere, in a reasonable price. Venetians go there especially to drink a glass of wine with some “cicchetti” (typical Venetian finger food) such as a slide of bread with salami, meatballs, “sarde in saor” (sardine seasoned in onion), “baccalà mantecato” (purée of dried cod) and many others. Near the station there is a bar very popular not among tourist but very frequented by students and Venetian people bar “Da Lele”. Here you can taste excellent and abundant aperitifs in Venetian style but cheap. The areas with more “bacari” are “San Polo” and “Canneregio”. If you are looking for something more quiet, you should go to “Castello”. Surely, the experience of a Bacari Tour will be more “Venetian” than a classic restaurant. There are some areas far from the touristic routes in which you can feel the magic atmosphere and the silence. Until you see the sunset in Venice, you can not realize why so many people consider it the most romantic city in the world. The best places to see the sunset in St. Mark’s Square are from the Hotel Danieli‘s terrace or from the top of the “Campanile di San Marco” (St. Mark’s Campanile). Sunset from the “Ponte di Rialto” is typically touristic but it is a real emotion. Sunset from the “Giudecca” maybe with a good “gianduiotto” (chocolate) or a typical Venetian biscuit is indescribable. Sunset from the “Isola di San Giorgio” with the view of the Lagoon and the St. Mark’s Square is priceless and super romantic. Young people, university students and many Venetians prefer the “Campo Santa Margherita” area. Here you will find the real nightlife of Venice. Do not miss it! There are bars, clubs, restaurants and wine bars, where you can have fun (or maybe spend a romantic evening). Those who love beer can not miss the “Il Santo Bevitore” pub, a few minutes far from the train station. Beers are of a great quality and often there is live music. If you love jazz music, do not miss the “Venice Jazz Club” near “Campo di Santa Margherita”. Here you will find live concerts, cocktails and good wine. For the more romantic ones, lose yourself among the streets and stop on the banks of the canals. The noise of the water and the silence in this less frequented areas (Castello and Cannaregio) will be your accompanist maybe while you are sipping a glass of wine. Discover the best and cheapest places to eat in Venice. Otherwise, you could try the famous Hard Rock Café (the smallest in Europe) that is on the edge of it. For connoisseurs and those who have already been to other parts of Europe, you will surely remember that is one of the places that attracts a lot of people and it is normal to wait for the table. To avoid the queue and do not waste time, it is better to buy a ticket that includes a meal at the Hard Rock Café with priority seats. You could try in “Calle degli Albanesi”, not so far from St. Marks Square, the “Ristorante alla Basilica” where the menu has a lot of dishes. You can choose from many different dishes of meat or fish cooked with fresh products. In this restaurant there is a fixed price: you can choose a first course, a second course or a side dish, among those proposed, at an advantageous price. “Ristorante da Mario alla Fava” has a typical Venetian and traditional cuisine, but they research also the innovation of the dishes. It is located in “Calle dei Stagneri” n 5242, between the Rialto Bridge and San Marco. The restaurant “Al Giardinetto da Severino” is located in the “sestiere di Castello”, just a few minutes far from San Marco Square. This restaurant offers typical Venetian dishes such as “sarde in saor”, “seppie alla veneziana” (cuttlefish with polenta), “gransegola alla veneziana” (crab with lemon), “canoce” (mantis shrimps), “falpoti lessi” (octopus boiled) and other delicacies. The wine shop “Enoteca al Volto” is located in the “sestiere di San Marco”, at the end of “Calle Cavalli”. Dishes are simple and natural: everyone prepared according to the season and the raw materials purchased at the Rialto’s market. The speciality of the restaurant is fish, always fresh: “bigoli in salsa” (pasta with anchovies), “spaghetti al nero di seppia” (spaghetti with squid ink) and “tris i baccalà con polenta” (salt cod with polenta). For lovers of vegan cuisine of for those who want to eat vegan in Venice, we refer to our post that gives you all the information. Not so far from Venice, easily reachable by public transport, stand an island also known as “Isola dei fuochi” (literal meaning “the island of fires”). Murano is famous for the art of master glass-worker. With their experience, passed down through generations, the masters are able to work the glass in order to transform it into unique and inimitable items or works of art. Do not miss it! Burano is a small island, full of alternatives, history and characteristic attractions. Here you will see the colourful houses, typical products such as “merletti” and “pizzi” (two types of laces) and a hanging bell tower. Torcello was the first settlement of the Serenissima and in the past this islan was richer and more powerful than Venice. There is a mysterious and evocative environment, where the quietness is one of the elements that distinguish the place. The islands can be visited through the ACTV boat connections, just go to the site to find the maps with lines and timetables to better understand how to reach the various islands. We suggest you to take a look at the tour of the three most known islands that should be a must for the people who come to Venice. In this way you have the opportunity to visit Murano, Burano and Torcello with a single ticket. The numbered cabin are characteristic of the beach resort of this island. It is located between the Venetian Lagoon and the Adriatic Sea. The island had hosted reigning, artists and celebrities. Since 2009 has been awarded the prestigious “Bandiera Blu” (a blue flag that it is given to the beaches for the sustainable land management and for the quality of its water). Every September here it takes place the “Mostra Internazionale del Cinema” (Venice Film Festival). In the island there is also the ancient monastery of San Nicolò (the historical and monumental heart of the island) and the “Borgo Malomocco” (a small Venice with “calli” (streets), “campielli” (small squares) and houses very near each other. Furthermore, there is a protected WWF oasis of Alberoni dunes and, of course, the Lagoon. In summer there are many sport facilities (i.e. the golf course of Alberoni, one of the most beautiful and ancient golf club in Italy). There are several way in which you are able to visit different cities in the surroundings of Venice in just one day (or even half ) without getting too far. It could be a day trip to Treviso or a tour to Verona to visit Romeo and Juliet’s balcony. A day trip to Verona is unmissable if you have never been there. Verona is easily reachable by train leaving from the “Venezia Santa Lucia” station. Throughout the day there are trains about every half hour both ways. Most trains are “freccia bianca” (fast train) so you will get to Verona in less than one hour. With a local train you have to pay attention because there are fast and slow trains and with the latter it takes almost two hours. When you arrive at “Verona Porta Nuova Station” (Verona central station) you can ask for a city map and other information to the Touristic Information Office that is located in the station. From here you can walk to “Piazza Brà” because it only takes 15 minutes and you will be in the centre of Verona. Verona is famous all over the world for being the city of Romeo and Juliet and for the Roman “Arena”. In addition, Verona is a beautiful city with a beautiful medieval old town, romantic neighbourhoods on the banks of the river Adige. It is the 4th Italian city for sightseeing (preceded by Rome, Venice and Florence). The main attraction of the city is the Verona Arena (entrance fee: 6 euros). It was build on the 1st century B.C. It is the 3rd largest Roman amphitheatre in size and maybe the best preserved one. In the Arena from May to September it is normal to see there a concert or an opera taking place. The square in front of the Arena is called “Piazza Brà”, one of the largest and most beautiful squares in the city. From here it starts “Via Mazzini”, a shopping street which will take you to the old town, where you can see “Piazza delle Erbe”, “Piazza dei Signori”, “Torre dei Lamberti” and nearby the famous Juliet’s house (entrance feee: 6 euros). In Juliet’s house you can admire the famous balcony of Shakespeare’s opera, Juliet’s statue and the house-museum with many evidences that testify the daily life of Romeo and Juliet’s period. Other attractions that you should not miss in Verona are: the Roman Theatre (entrance fee: 4,50 euros), the Juliet’s Tomb, the Cathedral and the Basilica of San Zeno. Through the city tour of Verona you could admire the city walls and the “Ponte Pietra” that cross the Adige before starting the tour of the city by foot. Head to the Verona Arena, an exceptionally preserved Roman amphitheatre. For bike lovers you could try the city tour by bike that allows you to admire the historical sites and less known places of the old town: from “Piazza delle Erbe” to the belvedere of “Castel San Pietro”. For cuisine lovers you could discover the local tradition through a food and wine tour on foot. Treviso can be reached mainly in two ways: by bus or by train. You can take the bus from “Piazzale Roma” and in more than half an hour you arrive in Treviso. With the train it takes a little less leaving from “Venezia Santa Lucia”. For further information about timetables, tickets, prices and more visit the ACTV website or ask at the ticket offices on site before leaving. Treviso does not have so many attractions, but it is full of romantic corners and wonderful squares. There is also a “borgo” (small medieval village). Very characteristic things to see are the historical buildings, the narrow medieval lanes, the ancient water mills, the picturesque canals and the beautiful arcades. Come and visit Treviso to discover a world that has remained unchanged from time with its squares and enchanting places. Treviso has a wonderful old town with the beautiful “Piazza dei Signori”, with its magnificent buildings. In order to visit Treviso’s city it takes about half a day or the whole day, it depends on your desire and physical condition. People who are keen on art should visit the “Museo Luigi Balio”, where the painting of famous Venetian artists are on exhibit. You should also visit the “Chiesa di San Nicolò” to see Tommaso da Modena’s frescoes. If you take “Via Angelo Garbizza”, you will reach “Piazza Duomo” with the monumental Cathedral of Treviso. Exactly behind “Palazzo dei Trecento” you will find “Piazza San Vito” with two beautiful chapels. From here you will reach the small river island on “Canale Cagnan” with the famous fish market. Take then “Via San Parisio” until the “Chiesa di San Francesco“, where the tomb of Pietro (Dante’s son) stand. We suggest you take a short walk to the “Porta San Tommaso”, where you can enjoy a magnificent view of the Alps, if the sky is crystal clear. If you want to take a short break and enjoy your time in Treviso, you can go to one of the many cafés and bars around “Piazza dei Signori” and also in the rest of the city. It offers a great service with wide and elegant rooms. A comfortable hotel and strategic as well, due to its proximity to the Mestre-Venice train station, only a 2 minutes’ walk away. The hotel is provided with a business center and a meeting room with wi-fi available in the whole hotel, polyglot staff, coffee corner in the common areas and free newspapers in the hall. A very positively evaluated hotel under every point of view. This Art Déco styled hotel provides support for the booking of field trips and tickets, polyglot staff and laundry service. It is located at only 15km away from St. Mark’s Square, near the shops, restaurants and ferry boat stop. A hotel since 1919 that will take you into the Venetian atmosphere. This hotel at Venice Lido has its own private beach, a fully supplied spa, sauna and a restaurant. Built in the Belle Époque style, it will offer you wellness therapies, a terrace and support for the booking of field trips and tickets. Built in 1907, its polyglot staff will enthrall you with its classic elegance. Only 15 minutes away from the center. A XV century hotel just two steps away from St. Mark’s Square, in the heart of Venice. A hotel with a romantic atmosphere that also offers support for the booking of field trips and tickets, polyglot staff and a cafè corner in the common areas. Absolutely recommended. Tell us about your experience and leave comments about your one-week holiday in Venice. We will end with this wonderful video that will give you an overview of what you can do and see in the city during your stay! If you want to see other videos, we recommend the best 10 videos about Venice!